With the last few figures being finished off by the Hutt/Tawa team, and many of the crew helping over Easter, it is with some relief (no more painting brown) and sadness (being involved in such an amazing and important event) they say a farewell to this project. "I can't wait to see the finished product, this will be a highlight of the year for me," says Tom Leamy. "I want to thank my crew, Rob C, Chris O, Chris P, Rob A, Theren, Scott, Simon, Nick, Tim, Paul and Alex. We worked out that we have managed over 800 figures, and that's with two guys away for a month in the middle of the project. 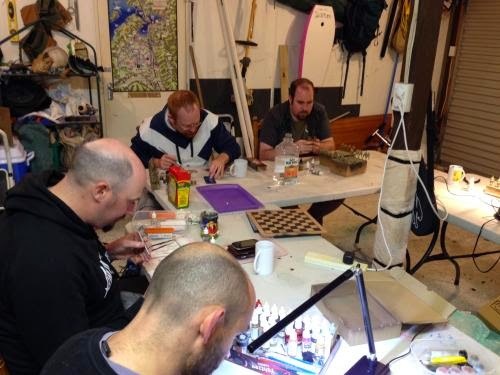 The painting evenings have been a real blast - and you gentlemen are an amazing bunch of artisans who I hold in the highest esteem. "Thanks to Roly, Rhys and the magnificent Peter for making the whole thing possible. Cheers to all the painters across this mighty land."